While education or trainings on sexual harassment is nothing new, we have redesigned this course with an emphasis on scenario driven learning. By focusing on a ‘learning by doing’ approach, we have enhanced our learners’ ability to successfully execute on the information provided in this course. Providing ways to mitigate risks is at the core of any insurance company. Through recent movements like #metoo, and the takedown of powerful celebrities, politicians, and journalists; the risky topic of sexual harassment in the workplace is rising to the forefront of conversations nationwide. In response to this, HAI Group is proud to announce the release of a new online course to help educate and prevent sexual harassment. As the leading provider of insurance, risk management, training, capital, research, and advocacy solutions tailor-made for the public and affordable housing industry; this course is specifically geared towards educating and preventing sexual harassment for those employees. Females are faced with the awful reality of having a one in three chance of experiencing sexual harassment in the workplace. Men have a one in five chance. With these alarming statistics, it’s critical for all employees to think about how this relates to them and for employers to educate their employees on prevention. The course provides information on how to recognize and understand sexual harassment, methods to identify several forms of unlawful workplace behaviors, and expectations on how to take the appropriate course of action. 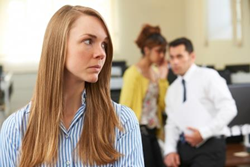 By reviewing quid pro quo, hostile work environment, cyberbullying, and discrimination; this course provides the necessary tools to successfully work through harassment situations. Available to any business or organization for just $50 per learner, with group discounts available. To learn more about how to handle various forms of sexual harassment in the workplace, view a simulated scenario, or enroll in the training, please click here.